Abbas Vosoogh received the M.Sc. degree from K. N. Toosi University of Technology, Tehran, Iran, and the PhD degree from Chalmers University of Technology, Gothenburg, Sweden, in 2011 and 2018, respectively. His current research interests include system integration and packaging for millimeter and sub-millimeter wave applications, metasurfaces, passive components, and planar array antennas design. 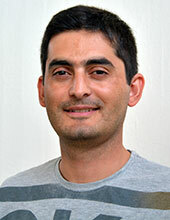 Dr. Vosoogh was a recipient of the Best Student Paper Award of the 2015 International Symposium on Antennas and Propagation, TAS, Australia, the CST University Publication Award 2016, the Best Paper Award and the Best Student Paper Award of the 2016 International Symposium on Antennas and Propagation, Okinawa, Japan, the First Prize Student Award of the 2017 IEEE International Symposium on Antennas and Propagation and USNC-URSI Radio Science Meeting, San Diego, CA, USA, and the 2019 EurAAP Per-Simon Kildal Award for best PhD in Antennas & Propagation. Det kan finnas fler projekt där Abbas Vosoogh medverkar, men du måste vara inloggad som anställd på Chalmers för att kunna se dem.